The weather on the Greek island of Crete plays by its own rules. The landmass of Crete is large enough to have its own weather zones, which change as you go north and south or east and west across the island. And since Crete is a mixture of lowland and mountainous regions, there are also weather and temperature variations based on altitude. The weather on the north coast of Crete will be strongly affected by the Meltemi winds of summer. These warm winds blow from the north and can hit most of the coastal beaches. While they are "warm" winds, they can kick up the waves and at their strongest can even blow sand around, providing sunbathers with a free exfoliation treatment which may not be wanted. Since most of Crete's organized resorts are on the North Coast, you may experience these winds, especially in July and August. Weather in Crete is affected by the spinal ridge of mountain ranges which run east to west across the island. The mountain ranges of Crete affect the weather in a couple of ways. First, they create a physical barrier for the winds from the North. This means that even when the north coast is uncomfortably windy, the south coast may be calm and pleasant. The exception to this is where gorges and valleys channel the north winds, which can create areas of intense winds at certain spots along the coast. This is especially true at Frangocastello and Plakias Bay. Even when the rest of the south coast is relatively calm, the funneling effect can create havoc for small fishing boats and other light craft. The South Coast is sometimes subject to winds up from Africa, something that Joni Mitchell memorialized in her song "Carey," written while the singer was staying in Matala on the south coast. These hot and sandy winds can result in dust storms that cloak Crete and all of Greece in an eerie dim light, sometimes affecting air travel. The fire that destroyed the Minoan Palace of Knossos has been determined to have burned on a day when the winds were coming up from the south. Spring on Crete truly begins in April, when the island is awash in flowers. Temperatures aren't too hot at this point, making it a great season for hiking and cycling. By April, the water temperatures are warm enough for swimming. What to pack: Pack light clothing with warmer layers for evenings—the low temperatures in Crete can still be quite chilly during the spring, so you'll want a sweater or light jacket just in case. Summer is almost pure sunshine in Crete and often warm temperatures, as heatwaves from Africa can cause the mercury to rise. Interior temperatures can sometimes exceed 100 degrees Fahrenheit (38 degrees Celsius). Summer is also quite dry and it's common to go for weeks, if not a month, without rain. If there's a breeze, temperatures still feel quite bearable even if the thermometer says otherwise. Needless to say, this is the ideal season for beachgoers. What to Pack: Pack a swimsuit and high-rated sunscreen if you plan on spending time on the beach. Light cotton and linen-blend clothing is useful, as are sandals for those extremely warm days. 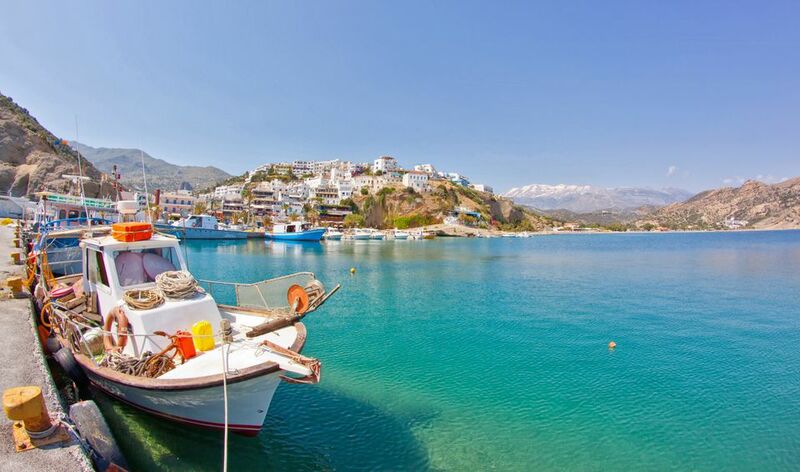 Crete experiences a late summer, with warm temperatures and seawater often through November. This is also a great time to hike or explore other activities on the island without throngs of people. Late fall can be rainier than the rest of the year, but still dry overall. What to pack: Your fall packing list for Crete shouldn't vary too much, with the exception of a light sweater or pullover for layering on cooler nights. If you want to see Crete without tourists, visit during the winter. While there might be a bit more rain than other seasons, the island remains warm overall, although sometimes cold winds can make it feel colder than it actually is. Winter is also a nice time to visit if you're interested in the local spirit, Raki, or the olive harvest. What to pack: While some days can be warm, you'll want to pack as you would for a trip to a traditional fall climate: Jeans and light layers are appropriate here.